Recently, There are some terms being used when it comes to Blogging/Web Designing which many Newbie Bloggers might find a bit difficult to understand, what exactly it means and how it works. Although there are so many of such terms but we'll be looking towards the link aspect tonight where we have No-follow and Do-follow. These terms are always used when talking about backlinks hence No-follow links and Do-follow links. Briefly, the two type of links mentioned above are different from each other because the No-follow link from a website A to B is simply telling bots that rank websites / blogs on Search engines that - I know website B but I don't know if it is safe & secure so I can't really vouch for website B. On the other hand, Do-follow link from website A to B is simply telling bots that I know website B and I am sure it is safe & secure so I can vouch for it thereby Do-follow link helps the website/blog its pointing to, to gain trust provided that the referring website/blog is already trusted and well ranked in Search Engines, this is where Pagerank comes in (Pagerank will be explained fully in one of our future posts). 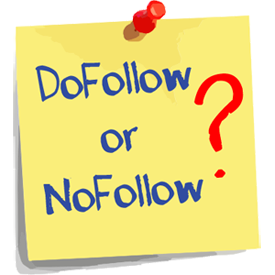 Since we are not discussing fully about No-follow and Do-follow links in this post rather we're discussing on how to differentiate both, I hope the short illustration above is enough to show you the overview of what No-follow and Do-follow link means. Now, How would you know if a link is No-follow or Do-follow ? Note - There is no attribute for Do-follow links, a link is automatically Do-follow once it doesn't have the rel=nofollow attribute in the link tag.